Marie-Charlotte Buisson’s research interests cover impact evaluation, agricultural microeconomics, natural resources management, vulnerability and households’ behaviour. She holds a PhD in Economics from the CERDI (Studies and Research Centre on International Development) in France. Along with her research, Marie-Charlotte has conducted several impact evaluations and socio-economic surveys around the world (Africa, Central Asia, South-East Asia) with the purpose of enlightening the decision making process at the micro level in order to understand how vulnerability may be alleviated. Marie-Charlotte joined IWMI, New-Delhi office, in June 2012, and is now International Researcher in Economics and Impact Evaluation. She leads several research projects on community-led organizations for improved water access and better water governance. Polders in the coastal zone of Bangladesh are low-lying areas surrounded by embankments. These embankments were constructed in the 1960s to avoid damages from floods and cyclones and intrusion of salinity. An elaborate network of canals and gates was constructed at the same time to regulate the inflow and outflow of water depending on irrigation and drainage requirements (Islam 2006; Brammer 2014). However, water management challenges in the polders stifle the potential of agricultural growth in the coastal region (Islam 2006; Dewan et al. 2014). Studies have shown that water-logging is a crucial problem in many parts of coastal Bangladesh resulting in damage of ‘aman’ rice during monsoon as well as delayed sowing of next dry-season crop (Moniruzzaman 2012; Awal 2014). The excessive water-logging is mainly due to siltation of canals and non-maintenance of the gates. The maintenance of these water-related infrastructures play out like a classic public goods game. Canals and gates being public goods means anybody can get the benefits without contributing for their maintenance. Without any maintenance, the situation of these infrastructures goes on worsening until it becomes so immensely expensive to repair that the local community can no longer repair them without external monetary help (government/donors). Regular maintenance and contributions (which can be in cash, kind or work) can be handled by the communities but currently, this requirement breaks down because of the free riding issue (Tuong et al. 2014). In this context, we designed a modified threshold public goods game, with the objective to identify how much communication and leadership can help in increasing community contributions and maintain the public good in the long term. To match to the real world issue of canal maintenance, we designed a dynamic threshold public goods game (described later) and different forms of communication and leadership were introduced as treatments. Played as part of participatory action research, the second objective of the experimental games was to give an overall perspective of the situation to community members and a tool to try out innovative institutional solutions and evaluate their practicability. The remainder of the article is organised as follows. The second section presents the design of the experimental game. In the third section, we discuss the theoretical equilibrium of the game. The fourth section presents and discusses the results for the indicators of interest. Section five presents further discussion about individual outcomes and learning effects. Finally, the sixth section concludes with the main learning from the experimental game. Various studies have focused on assessing the effect of communication in achieving coordination in public goods game. Crawford (1998) gives an overview of both theoretical and experimental findings regarding the implication of communication via “cheap talk” in which the communication has no direct implication on payoffs. In his meta-analysis of impact of communication on social dilemmas, Balliet (2009) finds a largely positive effect of communication on cooperation, with a stronger effect in case of face-to-face discussion and large group communication. More recently, Palfrey et al. (2017) found that communication structures with unrestricted but anonymous text chatting through computer panels has the highest efficiency gains. Compared to the numerous lab-based experiments studying the impact of communication, there is relatively little field-based evidence of the efficacy of communication in achieving coordination. Aflagah et al. (2015) used N–way (N=10, 20) structured pre-play communication in a field setting in Senegal where players state how much they will contribute. Their results highlight that communication increases coordination only in large groups but they do not find significant results to indicate that communication has a stronger effect in case of a higher threshold or of uncertain and low outcome. Along with communication, leadership can also play a key role in achieving coordination in public goods game. ‘Leader’ is here defined as the player who is the first mover i.e. the one who contributes first; while other players are the ‘followers’. There has been a growing literature in experimental economics looking at different ways in which leadership can affect outcome in public goods games through information signalling (Potters et al. 2007), leader’s ability to exclude followers (Guth et al. 2007) or leader’s social status (Kumru and Vesterlund 2010). Even in the simplest case of leadership without any asymmetric information or additional powers, there is evidence of positive influence of leadership on overall contribution (Moxnes and Heijden 2003; Duffy et al. 2007; Jack and Recalde 2015). The ‘leader’ contributes more to set a good example and trigger reciprocity from other players. In such cases, the first contributor “leads by example”. However the literature also points to a tendency in which the followers try to undercut the leader’s contribution and free ride, which in turn may dampen the leader’s willingness to set a good example by committing first to contribute more (Haigner and Wakolbinger 2010; Rivas and Sutter 2011). The methods used to select the leader have also been studied and the results suggest that average group contributions are higher when leaders are chosen endogenously from the group rather than when the leader is imposed (Haigner and Wakolbinger 2010; Rivas and Sutter 2011). The literature on threshold public goods games also suggests that sequential contribution achieves greater success rates compared to simultaneous contribution (Erev and Rapoport 1990; Coats et al. 2009). 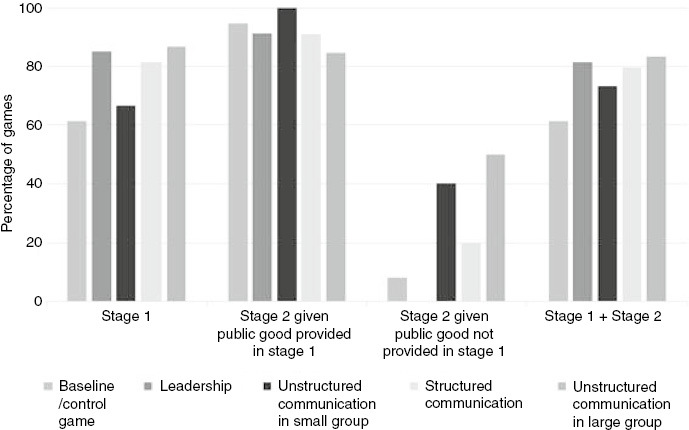 In this context, it becomes interesting to compare leadership vis-à-vis communication in achieving better coordination in threshold public goods games. Here leadership is considered in its limited sense of setting a good example by the first mover and we will only be using an endogenous leadership design. Therefore, in this paper, we compare different communication and leadership treatments in achieving coordination in a dynamic threshold public goods game. In the threshold public goods game a group of players must contribute from their endowments into some public fund. If the total contribution reaches a pre-determined threshold then all players receive a high payoff, otherwise everybody gets a low payoff. The literature has focused on a range of issues such as the effect of incomplete information (Marks and Croson 1999), the heterogeneity of the players (Bagnoli and McKee 1991; Mysker et al. 1996), the effect of costs and benefits on voluntary provision of the public goods (Cadsby et al. 2008), and the effect of communication on contributions (Tavoni et al. 2011). In their meta-analysis of threshold public goods games, Croson and Marks (2000) revealed that in larger groups it is more difficult to coordinate; while coordination is easier with continuous contribution than with dichotomous choice (all or nothing). We designed a dynamic version of the standard threshold public goods game, by having two stages of the standard game. The aim of the design was to reflect the dynamic nature of canal maintenance. Anderies et al. (2013) have similarly used dynamically deteriorating irrigation canals in order to understand the nature of public provisioning of physical infrastructure in the face of asymmetric players and outcome uncertainty. We discuss our specific design in the section below. In our baseline game, each participant was given e1 (10) tokens in each of two envelopes coloured blue and green. At the beginning of first stage, players needed to contribute simultaneously in a public pool from 10 tokens from their blue envelope. Let ci1 be contribution of ith member in stage 1. If total contribution from 10 members was greater than or equal to T1 (55) tokens, then each member received Gh1 (20) tokens; otherwise if contributions fell short of T1 tokens then each member got Gl1 (10) tokens. In the next stage players again had to contribute simultaneously in a common pool from e2 (10) tokens from the green envelope. If the total contribution from 10 members was greater than or equal to T2 tokens, then each member received Gh2 (20) tokens, otherwise if contributions felt short of T2 tokens they got Gl2 tokens each. In this second stage, the values of T2 and Gl2 were dependent on whether cooperation was achieved in the first stage or not. If coordination was achieved and the threshold was crossed in the first stage, then T2=55 tokens and Gl2=10 (i.e. same as first stage). However, if cooperation was not achieved in the first stage, then T2=75 tokens and Gl2=5. Here, the design aimed to reproduce the vicious cycle of maintenance with an increasing cost of reparation over time. The players were fully informed about these parameter values at the beginning of the first stage. Our payoff function differs from the standard version in two major ways. Firstly, we have two stages and the parameters in the second stage are a function of whether or not the threshold was crossed in the first stage. If in the first stage the group fails to reach the threshold then in second stage the threshold becomes higher and the loss in not making the threshold in the second stage also becomes larger. Secondly, we modify the payoff function to incorporate that if threshold is not met then players get a lower payoff and not zero. We designed the game in this way to reflect the reality of canal maintenance, where if maintenance is not done in initial years then in subsequent years it becomes very costly to renovate the canal. Also, the losses in agricultural outputs are likely to become higher when canals are not renovated and consequently irrigation as well as drainage become impossible. Moreover, in reality, even if coordination is not achieved farmers will still receive a positive payoff from using the canals and not a null payoff. In our design, if a player does not contribute in the first round he is guaranteed to get 20 tokens. Instead, if he contributes 1 token he can get maximum 29 tokens in the first round. This incentive might seem low but the players’ contribution also affects the threshold level and the penalty in the second round. So irrespective of how much a player contributes, he is assured of 35 tokens in total (20 in first and 15 in second round). However, if everybody contributes then on average a player can expect to get 49 tokens (5.5 tokens contributed in each round) and maximally he can get 58 tokens (with only 1 token contributed in each round). This design aims to capture the dynamic nature of players’ incentives. We acknowledge that in real world situations, people differ according to their wealth, which may influence their ability and willingness to contribute. In addition, the benefit of a public good, like well-functioning canal, could be different for different people. However, for simplicity in the game we assumed homogenous players in terms of endowment and benefit function. Along with this baseline control game, we played four other treatments that are described below. The choice of our treatments were based on preliminary qualitative field work on issues related to canal maintenance, governance and institutions as well as on literature review. The role of leaders, commonly called influential people who can be large farmers, shrimp farmers, local government representatives or religious leaders is essential in the context of coastal Bangladesh. Their informal influence and behavior can potentially have important impacts on the community members. As discussed before, there are many different reasons why one can expect leadership to foster better cooperation. However, in our design, we only consider leadership as the role of the first mover who sets good example. With the leadership treatment, we want to test the null hypothesis that initial contribution by a leader would positively motivate others to contribute and set up a norm for the group, which might help in achieving greater coordination. In this treatment, one player was chosen endogenously to contribute first, whose contribution was announced to the other nine players before they contributed themselves. Then the rest of the group contributed simultaneously as in the other treatments. All other parameters remained similar to the baseline treatment. The chosen player contributed first in both stages of the game. All the players knew who the leader was, how he was selected (randomly and/or endogenously) and how much s/he contributed. However, they did not know who else expressed interest to become leader and they did not know the contributions of the other nine players. However, except in one round out of 27 rounds of the leadership treatment, the leader was chosen endogenously. In four rounds, only one player wanted to be the first contributor and was therefore directly selected. In the rest more than one player expressed interest and the leader was randomly selected from them. Three other treatments included different degrees of communication amongst the players. The contribution of players in the public goods game that we have used crucially depends on their beliefs about how much the other players will contribute. Allowing communication serves two purposes. Firstly, through communication the players can negotiate among themselves and reach a consensus to set up a group norm. Secondly, communication refines the players’ beliefs about the possible contribution from others and helps in increasing the group income. These three communication treatments differ from the situation observed in most of the villages where communication on public issues is rarely institutionalised. Even where a Water Users’ Group has been formed, regular meetings and open discussions among its members are often very limited. As a result, direct communication between the users of the canals about its maintenance and use is often non-existent. This makes it extremely difficult for the community to coordinate in collecting contributions from users for regular maintenance of canals. Our assumption is that if communication is introduced, the risks associated with contribution can be reduced and coordination can be achieved. The three different communication treatments used are described below. In the case of structured communication, at the beginning of each stage for each round players indicated their intended contribution by writing on a piece of paper. This information was then announced publicly but anonymously in a random order. The total amount of the intended contribution was also announced. Next, the players made actual contributions simultaneously and the parameters remained similar to the baseline game. In addition, the intended contribution was not binding i.e. the players were free to contribute as much as they want, independently of what they announced. The idea of establishing the rules for communication before contributing was to reduce uncertainty about other players’ decisions and to help in establishing the norm of the group. In the real world, people do not interact through this kind of communication but the reason for studying it was to isolate the effect of basic informational content about intended contribution versus other forms of communication with more scope of detailed discussion and persuasion. In the case of unstructured communication in large group, at the beginning of each stage for each round all 10 players had a face-to-face open discussion. The communication was completely unstructured and the only rule established by the facilitators was not to threaten anyone. The communication happened in front of the experimenters to ensure that no individual targeting and pressuring happened. After this discussion, the game was played with the same parameters as in the baseline game. To allow the players to have a free and open discussion, records were not taken. One point to note here is that the communication that happened was informal and there was no binding agreement amongst players. The actual contributions were still anonymous and simultaneously decided as in the baseline game. So nobody could know what other players have actually contributed. By introducing this unstructured communication treatment, we expected to trigger non-pecuniary effects on players’ decisions. There are two primary differences between structured communication and unstructured communication. First, in structured communication, the focus was entirely on the intended contribution with no scope for discussion, whereas in unstructured communication players had the ability to convince others, to explain and discuss. The second difference is that in structured communication the intended contributions were anonymous while in unstructured communication there was a scope for people to know who intended to contribute how much. Unstructured communication in small group is exactly the same as that in large group as described above, the only difference being that during communication, the players were divided into groups of five people each and the two groups did not communicate amongst themselves. However, the threshold amount that needed to be crossed still depended on the total contribution of all 10 players. Similar to the large group treatment here also, the communication was completely unstructured and all other parameters of the game remained the same. With this treatment, the idea was to compare small group communication vis-à-vis large group communication. One assumption is that if in large groups a consensus is difficult to reach, it might become easier in smaller groups. However, in smaller groups there is also less information received by each player. The primary objective of looking at unstructured communication both in large and small groups was to compare the real world situation where everybody is involved in the communication versus the situation where communication only happens in smaller groups without any communication ever happening between these different groups. Large groups are for example akin to Water Management Associations with farmers from different villages, while smaller groups are akin to Water Management Groups with farmers from one village or even with plots neighbouring one sluice gate. The experimental games were conducted in five villages from high and intermediate levels of salinity zones from Satkhira and Khulna districts in coastal Bangladesh. The villages were selected based on secondary data and preliminary field visits. In all five selected villages canal siltation has been reported as one of the main problems even if the degree of siltation, the consequences and the role of the communities differ. In each village, we played with two groups of 10 players each. We had World Fish as our research partner in Bangladesh who were working in these villages for a long time. We asked them to select a more or less representative sample from farmers in each village. Some of the players were from groups involved in participatory action research for improved livelihoods and others were from the rest of the village community. In addition, we ensured the representation of women in the groups and villagers with different economic and social background as well to have a representative sample of players. However all our participants were from agricultural households and hence dependent on canals for irrigation and drainage purposes. The games started with a short introduction and then a detailed description. Four treatments were played with each group and the explanation of each treatment was given sequentially before playing that treatment.1 Adequate time was spent after the explanations to answer the questions of the participants so that everybody understood the rules and objective of the game. After completion of the games, we conducted a short survey to collect basic information about the demographic characteristics, wealth and social capital of the players. The games were conducted in a neutral language for research purposes and were not linked to the actual problem of canal maintenance. This differs from field experiments usually conducted in which the game is clearly contextualised and in which players’ actions might be dictated by what ought to be done. Our players were actual farmers from the community where these infrastructure maintenance issues are very real. This is a unique feature of our game. However, after the games were played, open discussion sessions were conducted with all the players to contextualise the games, get feedback from the players and identify potential lessons in achieving coordination for improved management of their water infrastructures. We played with 10 groups and a total of 100 players. Each group played four treatments only (including the baseline game) and each treatment was repeated three times. Thus, for each group, 12 repetitions were played. While designing the combination of treatments we decided that since treatment D and treatment E are very similar they would not be played by the same group. We therefore had two combinations either ABCD or ABCE. To achieve a relatively balanced sample for each of our treatments, these two combinations were equally divided among our 10 groups, i.e. each combination was played by 5 groups. After finalising the combination of treatments, it was ensured that the order in which the treatments are played be different in each group. The purpose of doing this was to ensure that the learning effect does not bias the effect of a particular treatment. Indeed, the player’s decisions may be dependent on which round the treatment is being played, as the player learns through repeated playing so it becomes important to change the sequence of treatments for different groups. Ultimately, we had two groups starting with game A, two groups starting with game B and so on. Given this restriction, a particular sequence of treatment for the group was chosen randomly. Table 1 gives our final sample. aIn one village due to some logistical reasons, we had only 3 treatments, with baseline played 4 times. All the games were done in complete information and common knowledge framework i.e. the entire game was explained openly at the beginning of the game with all parameters being announced. The players also knew beforehand that there would be three rounds for each of the treatments. They were also informed that real payments will be made at the end of the game and that after the three rounds of each treatment, one repetition out of the three will be randomly selected for deciding the value of the actual payments. The total contribution was reported after each stage of the game but the individual value of the contribution remained anonymous. Each participant was paid BDT2 30 as showup fee. Any additional income depended on the outcome of the games. The total income earned by the players was BDT 163 on average, with the maximum and minimum incomes being BDT 210 and BDT 100, respectively. Given that the players were engaged for three hours approximately, the average earning of the players was commensurate with average daily agricultural rate for men in the month of November, which was BDT 270 (Bangladesh Bureau of Statistics 2013). Before analysing the results of our experiments, it is necessary to discuss the possible equilibria of our game, as it is against this benchmark that we interpret results. Croson and Marks (2000) analysed the one stage threshold public goods game with no refund and homogenous players. It has two sets of equilibria – first is the inefficient Nash equilibrium in which nobody contributes and the minimum threshold amount or “cost of the public good” is not met, and second is the set of efficient Nash equilibrium where the total contribution exactly equals the minimum threshold amount. Our baseline game differs from this one stage threshold public goods game in two ways: firstly there are two stages of threshold public goods game with no refund and secondly the parameters in the second stage are dependent on the outcomes of the first stage. So it becomes necessary to study the sub-game perfect Nash equilibrium of this two stage threshold public goods game. We restrict our analysis to pure strategy equilibria. In order to discuss the sub-game perfect Nash equilibrium of our game, we start with the second stage of baseline game. In the second stage, the baseline game is exactly the same as the one stage threshold public goods game with no refund. So as discussed before it has two Nash equilibrium solutions: either nobody contributes or else total contribution exactly equals the minimum threshold amount or “cost”. Indeed, if nobody contributes then no individual player has the incentive or ability to supplement the pool and reach the threshold amount. Alternatively, if total contribution is exactly equal to the minimum threshold amount then, however unequal the individual contributions are, no player has incentive to reduce his contribution; indeed, such action would not increase his private income by more than what he loses in income from public good provision. One point to note is that given the parameters in our games (threshold amount either 55 or 75 and 10 players), this set of Pareto efficient equilibria is an asymmetric pure strategy Nash equilibrium, with unequal contribution from players. There exists no symmetric pure strategy equilibrium, in this set of Pareto efficient equilibrium. There is no other equilibrium. If total contribution exceeds minimum threshold then at least one player can increase his private consumption without affecting public good provision. If total contribution is less than threshold amount, then either some player has both the ability and incentive to increase contribution in public pool or there is at least one player who does not have ability to supplement the public pool and hence has incentive to reduce his contribution to zero. These two sets of equilibria in the second stage is irrespective of which node the game is at, i.e. threshold is 55 or 75. In first stage of the game, players have threshold 55, but their contribution decides what will be threshold at next stage. Here also there are two Nash equilibria: either nobody contributes or else total contribution exactly equals the minimum threshold of 55 tokens. The reasons are the same as before. So, in our baseline game, the sub-game perfect Nash equilibrium alternatives are (i) no contribution in both first stage and in second stage (ii) no contribution in first stage and total contribution exactly equals 75 tokens in second stage, (iii) in first stage total contribution exactly equals 55 tokens and in second stage total contribution is zero (iv) contribution exactly equals 55 tokens in the first stage and 55 tokens in the second stage. Let us consider the leadership game in its second stage with threshold set at T (55 or 75) tokens. Let us consider the leader has contributed L (0<=L <=10) tokens. For the nine players who are followers they contribute simultaneously. For them the threshold is T-L. This game is the same as our original baseline game. So possible Nash equilibrium are that all nine players contribute zero (T-L>e=10) or total contribution of nine players is exactly equal to T-L. The reasoning is the same as before. For each possible contribution by leader L (0–10), i.e. for each of the final nodes of the sequential game, there are multiple equilibria. Choosing any particular strategy profile for the nine followers or choosing one Nash equilibrium in each of these final sub-games, we have to find the leader’s optimum action. The leader’s optimum contribution is the minimum L say L0, at which the Nash equilibrium is T-L0 rather than zero. If at all nodes, Nash equilibrium is zero contribution by all nine players then leader will also contribute zero. This is one sub-game perfect Nash equilibrium. If at L0, Nash equilibrium of nine followers is T-L0 and for all L <L0, Nash equilibrium is zero contribution from all nine players, then leader’s optimum is L0. This is SPNE. So even in this leadership game, all possible sub-game perfect Nash equilibria are reached i.e. the leader contributes zero, and all nine followers contribute zero; or leader contributes L0 and all nine followers contribute together (T-L0), where 0<=L0 <=10. In structured communication treatment and unstructured communication treatment (with both large group and small group), the parameters remain the same as in baseline game. The only difference is that in each stage of the game, players communicate amongst themselves in a non-binding way. This does not affect the equilibrium in any way and the Nash equilibrium of our game does not differ from the baseline game. The set of pure strategy Nash equilibria in each of the treatments is similar to the one from the baseline game. Our interest is to find out to what extent groups can achieve the Pareto efficient set of Nash equilibria under different treatments. We look at three group variables to measure the effectiveness of any treatment in achieving coordination: the success rate in crossing the threshold and ensuring public good provision; the average contribution of players; and finally how much the group income falls short of the maximum income that they could have earned, i.e. deviation from the optimum income. Since our public goods game has two stages with varying thresholds, we analyse stage 1 and stage 2 separately along with looking at the two stages together. Moreover, in stage 2, the threshold level could be either 55 tokens or 75 tokens, depending on the success in the first stage; therefore, in our analysis we differentiate between these two cases in stage 2. As robustness checks, we finally analyse the individual income and test the impact of the learning effect. First, we consider the provision of the public good or the success rate across the treatments in stage 1 and 2 (Figure 1). The rate of success in crossing the threshold of 55 tokens in stage 1 is the lowest in the baseline games (61%) and the highest in large groups with unstructured communication (87%). If the leadership treatment is ignored, then we note that the rate of success gradually increases with communication. This first result confirms our assumption. Interestingly the leadership treatment is also extremely successful in achieving public good provision in spite of its limited scope of communication, since 85% of the rounds played with this treatment crossed the threshold and delivered the public good in stage 1. Pairwise t-tests of different treatments vis-à-vis baseline confirms that in stage 1, apart from the small group communication treatment, all the three other treatments reach a significantly (at less than 1%) higher success rate than the baseline game. Proportion of games in which public good provided. If public good was provided in stage 1, the success rate of stage 2 is very high, above 80% across all treatments. However, pairwise t-tests identify no significant differences between the different treatments and the baseline game. This overall high success rate, irrespective of the level of communication between the players, means that if in stage 1 the group successfully reaches the threshold then they do not change their contribution in stage 2. This result highlights that when a group experiences success in the delivery of a public good, members keep reproducing the same behaviour to receive the same benefits again. This initial success sets the norm and initiates a virtuous circle. This point will also be clear when we explore the pattern of individual contribution. On the contrary, if the public good was not provided in stage 1, and threshold has increased to 75 tokens then we observe a dramatic decrease in the success rate in stage 2. On average, considering all the treatments, the average success rate in stage 2 when stage 1 failed, is 18%. This is the opposite scenario; the inability of the group to succeed in the first stage makes the success in the second stage very unlikely. This situation is akin to a vicious circle and reproduces the actual maintenance issue, when the repeated lack of maintenance makes community engagement to solve the issue less and less likely. This situation arises because of the cost, which gets more and more expensive over time due to deferred maintenance. Only the treatments with small group unstructured communication and large group unstructured communication achieve slightly higher success rate in stage 2 when the stage 1 was not successful, respectively 40% and 50%; for these two treatments the success rates is also significantly higher than in baseline games. In leadership treatments, none of the games was successful and in structured communication treatments, only 20% of the games reached the required threshold. We can therefore consider that open communication, and especially in larger groups can be an effective tool to move out of the vicious circle of the deferred maintenance and to achieve successful coordination of the community again; even if the probability of success remains far lower than the one achieved in groups not experiencing failure. However, in this situation when the mistrust is established among the group members, the structured communication is not effective; indeed the players do not believe that the contributions announced by others will effectively be pooled. Similarly, the role of a leader is unavailing under this scenario; none of them has been able to re-establish trust and cooperation. Next, we analyse the average contribution of the players across different treatments. As shown in Table 2, in stage 1, the average contribution is above 5.5 tokens for all the treatments.3 T-tests establish that there is no significant difference across the treatments and between the treatment and baseline game in the first stage. The same holds true with the contributions of the second stage if the public good was provided in stage 1. The level of contributions between stage 1 and stage 2 when the stage one was successful are also very similar. Average contribution of players by treatments. However, if the public good was not provided in stage 1, then in the second stage, the threshold level was 75 and we note a sharp increase in the individual contribution in that case. In Table 2 comparing the cases where public good was provided in stage 1 vis-à-vis the case where public good was not provided in stage 1, we note that for all the treatments the average contribution in stage 2 is significantly higher when the public good was not provided in the first stage. This is confirmed by analysing how the contributions evolve from stage 1 to stage 2. In Table 3, the change in contribution is defined as the difference between individual contribution in stage 2 and the individual contribution in stage 1 (c2–c1). When the public good was provided in the first stage, on average players do not change their level of contribution in the second stage and the null hypothesis that c2–c1=0 cannot be rejected. This confirms the virtuous circle established in case of success, the willingness of the players to maintain their contributions to achieve the success again and the fact that communication tools are not essential under those conditions. On the contrary, when they failed to reach the threshold in stage 1, players increase their contribution significantly in the second stage. The difference between the contribution in stage 1 and 2 is highly significant for all the treatments. This is in the case of treatments with unstructured communication that the difference is the largest; in those cases, the players allocate 2 to 3 tokens more to the pool than they did in the first stage. These results mean that players take into consideration the challenge of reaching a higher threshold and increase their individual contribution to make the game successful. Average change in the level of individual contribution from stage 1 to stage 2. Note: ***Significantly different from zero at 1%. Yet, in spite of the increase in the level of contribution from stage 1 to stage 2 when the stage 1 failed, we previously saw that this is not enough to make most of these games successful and to reach the required threshold. Indeed, except for large group unstructured communication treatment, the average of individual contribution is lower than 7.5 tokens4 (Table 2). In this case, with unstructured communication in large group treatment, the average individual contribution is significantly higher than in the baseline games (Table 2). Results revealed that the unstructured communication among the entire group of players is the only treatment that has been able to re-establish coordination in the groups who experienced failure. Similar patterns are observed when we analyse the percentage of players who contributed in each stage of the game more than 5.5 or 7.5 tokens depending on whether the threshold is 55 tokens or 75 tokens respectively (Table 4). If the public good was not provided in stage 1 then in stage 2, most of the players step back and decide not to allocate to the pool the minimal number of tokens that would be required from each player for the group to reach the threshold. In those cases, the players do not think that they will get any returns from the group; they therefore decide to prefer their individual interest against the uncertain social interest. It is only with unstructured communication treatments that the majority of players allocate the minimum level of contribution which gives a chance to the group to succeed. 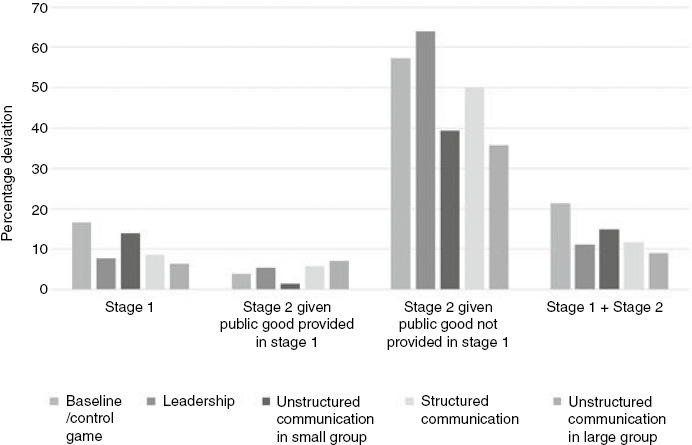 For example, in stage 2 when stage 1 failed and with unstructured communication in large group, 65% of the players contributed 7.5 or more tokens while they were only 40% likely to do so in baseline and leadership treatments. The percentage is also higher in stage 2 with no provision of the public good in stage 1 (65%) than in stage 1 (62%) or in stage 2 with provision of the public good (58%). This result confirms that when the challenge is important and the risk to fail in the vicious circle of deferred maintenance is high, only communication with all the stakeholders has a chance to achieve the delivery of the public good. Percentage of players whose contribution crossed the individual average amount needed to reach the group threshold. Finally, we look at the income earned by the group under various treatments. Mann-Whitney tests of these group level parameters across different treatments (adjusted for multiple comparisons) showed that the group income is significantly higher only in the case of unstructured communication in large group as compared to the control game. In Figure 2, we analyse the percentage of deviation between the actual income reached by the group and the optimum group income, i.e. the maximum income that could have been earned by the group as a whole for each game. Percentage deviation from optimum group income in each stage across treatments. With this design of the game, the step return function is greater than 1, the group always gets back more than what it invests at the threshold amount; but investing more than the threshold amount will not increase the return to the group. Therefore, the optimum income for the group is when the group contribution is exactly at the threshold level. The optimum group income in any stage of our game is calculated as: Iopt=200+(100 – threshold). Consequently, in stage 1, the optimum group income is 245 tokens. As the group contributes 55 tokens, it is left with 45 tokens and it gets back 200 tokens (20×10), making the total 245 tokens. In stage 2, if the threshold level is 55, then optimum income is 245 tokens and if the threshold is 75, then the optimum income is 225. If we combine stage 1 and stage 2, then the optimum income is achieved when public contribution in both stages is exactly equal to 55 tokens, which makes the total maximum group income as 490 tokens. In stage 2 across all the five treatments, we find that the deviation from the optimum income increases hugely compared to stage 1 if the public good was not provided in stage 1. Indeed the deviation is, respectively, at 5% and 52% in stage 2 when the stage 1 was successful and not successful. In this case, the threshold increases to 75 tokens and as a result, people increase their contribution but coordination become very difficult to achieve. This results in an important deviation from the optimum income. Yet with unstructured communication (both in large group and small group), this deviation is the lowest. For example, with unstructured communication in large group, the group loses 36% of the maximum income, which could have been earned whereas it was as high as 64% in the case of the leadership treatment. In addition, the deviation from the optimum income is lower in stage 2 when the public good was provided in stage 1 as compared to stage 1. On average in stage 1, the group income is 11% less than the optimal income, but in the second stage with provision of the public good in stage 1 it is 5%. This result reinforces the idea of the virtuous circle previously mentioned. Not only are the players easily able to reproduce a success and to deliver the public good again if they already experienced it, but in addition they increase their income as a group to come closer to the optimum social benefit. It should be noted that in stage 1 or in stage 2 with success in stage 1, there are no significant differences in the level of deviation from the optimum income across the different treatments. This means that improved communication through specific tools is not necessarily needed in a group who already coordinated successfully in the past, and in that case individual simultaneous decisions without communication will not perform worse than with communication. Finally, combining all the cases together, we identify a gradient in the deviation from the optimum income that matches with the degree of communication. With unstructured communication in large groups before deciding the individual level of contribution, the actual income earned is 9% lower than the optimum income whereas it is more than 21% when contributions are decided without any preceding communication among the players. Overall, this highlights the essential role of communication to reach higher benefits both from individual and social perspectives. Analysing the group level parameters, we demonstrate the role of a vicious or virtuous circle in the provision of public goods in a dynamic threshold design and the positive impact of unstructured communication as compared to the other treatments in the achievement of coordination. However, with group level parameters, we have only 115 observations for comparing five treatments. With this limited sample size, power may be insufficient to detect additional differences between the treatments. We therefore analyse the total income for each individual (Table 5). Total individual income from both stages of the game. Note: 1Based on multiple Mann-Whitney tests, accounting for family-wise error; diverging superscript letters between any two treatments indicate difference in mean income is statistically significant at 0.01 level, while if any two treatment have a common superscript letter then they do not have any statistically significant difference. We find that leadership, structured communication, and unstructured communication in large group are all significantly different from control game at 1%. This confirms the results established from the analysis of the group parameters. However, we could not find significant difference amongst these four treatments. Regression analysis: individual income and treatments. Note: Group id constants, total number of rounds already played, total number of treatments already played and constant included as control variables. *Significantly different from 0 at 10%, **at 5%, ***at 1%. Robust standard errors are in brackets. All four treatments have a positive impact on the individual income as compared to the control game, which is omitted variable here. In coherence with the previous results, the highest coefficient is for unstructured communication in large groups (significant at less than 5%), followed by structured communication and unstructured communication which are both significant at 10%. In our design, to ensure that learning effects do not bias our results we randomised the sequence in which the treatments were played. To test that this is actually not the case, in Table 7 Col 1, Spearman rank correlation coefficients are presented between player’s contribution and the round in which it is played (from 1 to 12). In column 2, the correlation is given between players’ contribution and the game sequence in which it was played (from 1 to 4 – this is the sequence of a particular treatment amongst the 4 treatments that each group played). No significant correlations are identified and the correlation coefficients are close to zero. This confirms that the game design selected avoids the contamination of results with learning effects bias. Correlation between player’s contribution and sequence of the game. Note: The coefficients presented are Spearman’s Rank correlation coefficients. p-values are in italic. At the end of the day, facilitators invited all the players from the village to discuss their experience/learnings from the games and to think about the similarities and implications this could have in their water related issues. The relationship of this game with the canal maintenance issue was discussed. Most players said that playing the game and then thinking and discussing about it later they have understood better why community contributions for canal maintenance often fails and how open communication can help in achieving coordination. Many players were clear on the main results and mentioned that institutions should be set up to facilitate regular and open communication among community members and beneficiaries of the water infrastructures. They consider that this type of institution does not exist so far. They also recognised that although communication with all the stakeholders is the most effective tool, in a context of important socio-economic heterogeneity, it is unlikely that community members can endogenously organise themselves and start such an initiative. Players mentioned that a third party, who can, for example, be local government actors, should initiate the process and bring the people together. In this paper, we have used a sequential version of the threshold public goods game, where there are two stages of the game and action in the first stage determines the threshold level in the second stage. This game was designed to stylise the public good problem faced every day by the people of coastal Bangladesh in managing the water infrastructures in the polders. Water infrastructures in the village require regular maintenance. If this maintenance is not done regularly then over the years, the situation worsens and the small damage becomes bigger and costlier until the repairs become beyond the capacity of community members. In that case, external help is required but livelihoods are damaged in the meantime. To avoid this situation, communities need to organise themselves and initiate coordination to contribute for regular maintenance. However, in reality, this coordination is rare and in this paper, we have tried to examine how different mechanisms can help in achieving improved coordination. Along with the basic game defined in the baseline, we played four other variations: a leadership treatment in which one of the players contributes first and his contribution is known to all, a treatment with structured communication in which players indicated anonymously and without binding how much they would like to contribute before actual contribution, a treatment with unstructured communication in which players openly talk among themselves before their actual contribution in small (five) or large groups (ten). As already described in the literature, the analysis from the games confirms that in the first stage of the game when the degree of communication increases, the success rate of coordination (crossing the threshold) increases. In the literature, all of these treatments show a positive effect on the coordination but we make a relative comparison amongst them and show that unstructured or open communication has the largest positive impact on achieving coordination and higher income. Beyond this, the novelty of the results concerns the dynamic nature of our design of the threshold public goods game played in a field setting outside the lab. We establish that if in stage 1 success is achieved, then in stage 2 players do not change their contribution and there is almost no difference across treatments. However, the crucial importance of communication comes out in stage 2 if in stage 1 the public good was not provided; in this case, the threshold is higher and coordination is even more difficult. Players increase their average contribution but it is not enough to cross the threshold. Under this scenario, open communication among all the members performs the best in achieving coordination and increasing group income. Another positive result from this game is that when communities experience success and receive the benefits from public good provision, a virtuous circle is started and there are good chances that the positive behaviours will be reproduced in the subsequent periods. This means that there is no perpetual trap and that communities can initiate sustainable and responsible practices for regular maintenance of their water infrastructures. The results from this experimental game compared to the reality of the canal maintenance issue provide arguments for establishing institutions able to initiate open communication in large groups of stakeholders with the support of external actors. Finally, a number of important questions remain which need to be further analysed to tie more closely the theory and the uptake of the research. We noted that larger groups reach higher success rates in the delivery of the public good but we wonder if a turning point exists and if communication becomes inefficient in very large groups. Also, we showed a virtuous circle when the players experience success in the first stage of the game. What the results would be in games with more than two periods is unknown. 1The detailed instructions given to the players are available upon request. 21 USD=77.40 BDT when the game was conducted, in November 2014. 3Since the threshold is 55 tokens and we had a group of 10 players, we consider that on average, each player had to contribute a minimum of 5.5 tokens (5 or 6) to cross the threshold. 4Since the threshold is 75 tokens in this situation and we had a group of 10 players, we consider that on average, each player had to contribute a minimum of 7.5 tokens (7 or 8) to cross the threshold. 5The individual income being censored within range of 10–60 tokens, so we also ran the same ­regression using a Tobit model. The results are consistent and available upon request. This article is based on research activities conducted for the project ‘Community Water Management from a micro-level perspective’, part of the CGIAR Research Program on Aquatic Agricultural Systems (AAS) in Khulna Hub of Bangladesh. This work also results from previous research conducted under the Challenge Program for Water and Food (CPWF) and the Water, Land and Ecosystem (WLE) CGIAR research programs. The authors thank Shourav Maitra, Nandish Kenia, the games’ facilitators and the community participants for their cooperation. Aflagah, F. K. D, Tanguy, B and Viceisza, A (2015). Communication and Coordination: Experimental Evidence from Farmer Groups in Senegal In: IFPRI Discussion Paper. Washington, DC: International Food Policy Research Institute (IFPRI). Anderies, J. M, Janssen, M. A, Lee, A and Wasserman, H (2013). Environmental Variability and Collective Action: Experimental Insights from an Irrigation Game. Ecological Economics 93: 166–176. https://doi.org/10.1016/j.ecolecon.2013.04.010. Awal, M. A (2014). Water Logging in Southwestern Coastal Region of Bangladesh: Local Adaptation and Policy Options. Science Postprint 1(1): e00038. https://doi.org/10.14340/spp.2014.12A0001. Bagnoli, M and McKee, M (1991). Voluntary Contribution Games: Efficient Private Provision of Public Goods. Economic Inquiry 29(2): 351–366. https://doi.org/10.1111/j.1465-7295.1991.tb01276.x. Balliet, D (2009). Communication and Cooperation in Social Dilemmas: A Meta-Analytic Review. Journal of Conflict Resolution 54(1): 39–57. https://doi.org/10.1177/0022002709352443. Bangladesh Bureau of Statistics. Monthly Statistical Bulletin of Bangladesh, June 2013. Bangladesh: Dhaka. Brammer, H (2014). Bangladesh’s Dynamic Coastal Regions and Sea-Level Rise. Climate Risk Management 1: 51–62. https://doi.org/10.1016/j.crm.2013.10.001. Cadsby, C. B, Croson, R, Marks, M and Maynes, E (2008). Step Return versus Net Reward in the Voluntary Provision of a Threshold Public Good: An Adversarial Collaboration. Public Choice 135(3–4): 277–289. https://doi.org/10.1007/s11127-007-9260-z. Coats, J. C, Gronberg, T. J and Grosskopf, B (2009). Simultaneous versus Sequential Public Good Provision and the Role of Refunds – an Experimental Study. Journal of Public Economics 93(1): 326–335. https://doi.org/10.1016/j.jpubeco.2008.06.002. Crawford, V (1998). A Survey of Experiments on Communication via Cheap Talk. Journal of Economic Theory 78(2): 286–298. https://doi.org/10.1006/jeth.1997.2359. Croson, R. T. A and Marks, M. B (2000). Step Returns in Threshold Public Goods: A Meta-and Experimental Analysis. Experimental Economics 2(3): 239–259. https://doi.org/10.1023/A:1009918829192. Dewan, C, Buisson, M.-C. and Mukherji, A. (2014). The Imposition of Participation? The Case of Participatory Water Management in Coastal Bangladesh. Water Alternatives 7(2): 342–366. Duffy, J, Ochs, J and Vesterlund, L (2007). Giving Little by Little: Dynamic Voluntary Contribution Games. Journal of Public Economics 91(9): 1708–1730. https://doi.org/10.1016/j.jpubeco.2007.04.001. Erev, I and Rapoport, A (1990). Provision of Step-Level Public Goods: The Sequential Contribution Mechanism. The Journal of Conflict Resolution 34(3): 401–425. https://doi.org/10.1177/0022002790034003002. Guth, W, Levati, M. V, Sutter, M and van der Heijden, E (2007). Leading by Example with and without Exclusion Power in Voluntary Contribution Experiments. Journal of Public Economics 91(5): 1023–1042. https://doi.org/10.1016/j.jpubeco.2006.10.007. Haigner, S. D and Wakolbinger, F (2010). To Lead or not to Lead: Endogenous Sequencing in Public Goods Games. Economics Letters 108(1): 93–95. https://doi.org/10.1016/j.econlet.2010.04.025. Islam, M. R (2006). Hoanh, C. T, Tuong, T. P, Gowing, J. W and Hardy, B eds. Managing Diverse Land Uses in Coastal Bangladesh: Institutional Approaches. Environment and Livelihoods in Tropical Coastal Zones: Managing Agriculture-Fishery-Aquaculture Conflicts. Wallingford, UK: CAB International. https://doi.org/10.1079/9781845931070.0237. Jack, B. K and Recalde, M. P (2015). Leadership and the Voluntary Provision of Public Goods: Field Evidence from Bolivia. Journal of Public Economics 122: 80–93. https://doi.org/10.1016/j.jpubeco.2014.10.003. Kumru, C. S and Vesterlund, L (2010). The Effect of Status on Charitable Giving. Journal of Public Economic Theory 12(4): 709–735. https://doi.org/10.1111/j.1467-9779.2010.01471.x. Marks, M. B and A. Croson, R. T (1999). The Effect of Incomplete Information in a Threshold Public Goods Experiment. Public Choice 99(1–2): 103–118. https://doi.org/10.1023/A:1018316500800. Moniruzzaman, M (2012). Filho, W. L. ed. Impact of Climate Change in Bangladesh: Water Logging at South-West Coast. Climate Change and the Sustainable use of Water Resource. Berlin, Heidelberg: Springer-Verlag. https://doi.org/10.1007/978-3-642-22266-5_21. Moxnes, E and Van der Heijden, E (2003). The Effect of Leadership in a Public Bad Experiment. Journal of Conflict Resolution 47(6): 773–795. https://doi.org/10.1177/0022002703258962. Mysker, M, Olson, P and Williams, A (1996). Isaac, R. M. ed. The Voluntary Provision of a Threshold Public Good: Further Experimental Results. Research in Experimental Economics. Greenwich, CT: JAI Press. Palfrey, T, Rosenthal, H and Roy, N (2017). How Cheap Talk Enhances Efficiency in Threshold Public Goods Games. Games and Economic Behavior 101(issue C): 234–259. https://doi.org/10.1016/j.geb.2015.10.004. Potters, J, Sefton, M and Vesterlund, L (2007). Leading-by-Example and Signaling in Voluntary Contribution Games: An Experimental Study. Economic Theory 33(1): 169–182. https://doi.org/10.1007/s00199-006-0186-3. Rivas, M. F and Sutter, M (2011). The Benefits of Voluntary Leadership in Experimental Public Goods Games. Economics Letters 112(2): 176–178. https://doi.org/10.1016/j.econlet.2011.04.007. Tavoni, A, Dannenberg, A, Kallis, G and Loschel, A (2011). Inequality, Communication, and the Avoidance of Disastrous Climate Change in a Public Goods Game. Proceedings of the National Academy of Sciences 108(29): 11825–11829. https://doi.org/10.1073/pnas.1102493108. Tuong, T. P, Humphreys, E, Khan, Z. H, Nelson, A, Mondal, M, Buisson, M.-C. and George, P. (2014). Messages from the Ganges Basin Development Challenge: Unlocking the Production Potential of the Polders of the Coastal Zone of Bangladesh through Water Management Investment and Reform.